More [video] proof that the lovely couple will be hitting the Broadway stage this autumn! Ms. Weisz was interviewed while promoting her new Disney film, OZ: The Great and Powerful and was asked what her next dream job would be! Skip to the 3:07 mark for her answer! 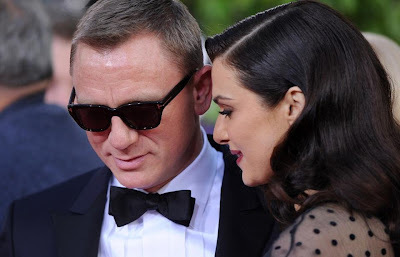 It was rumoured that Daniel Craig would join wife, Rachel Weisz after her interview on Daybreak, in which she also confirmed that Daniel would be in the play but no video of said interview has surfaced. "I am going to do a play on Broadway... It's confirmed. I've never done Broadway (so I am) very excited. It's (Broadway has) got this mythical shine about it." It is believed the couple will be in a Mike Nichols helmed production of Harold Pinter's Betrayal! The play follows an affair between the wife of a publisher and his best friend, a literary agent. The story is told in reverse with the play beginning five years after the affair has ended. It's a fascinating play and I encourage you to read it! Now who should play Jerry (the best friend)??? My dreamcast would be a reunion with Craig's A Steady Rain partner, Hugh Jackman! Your pick? It is now rumoured that the lovely couple will be the leads in Roundabout Theater's production of Tom Stoppard's The Real Thing! Roundabout announced two more addition of their 2013/2014 season, including The Real Thing and speculation began about the joining the Sam Gold helmed production, rather than the earlier rumoured Pinter's Betrayal! So many rumours, I'd just like some hard facts! Either way, I cannot wait to see both on Broadway! Please announce soon!